PPSC Latest Jobs Advertisement No 28/2018 for PPSC Latest Jobs 2018 is given below. The PPSC Advertisement No 28/2018 for PPSC Latest Jobs 2018 is come on today newspaper Jung. 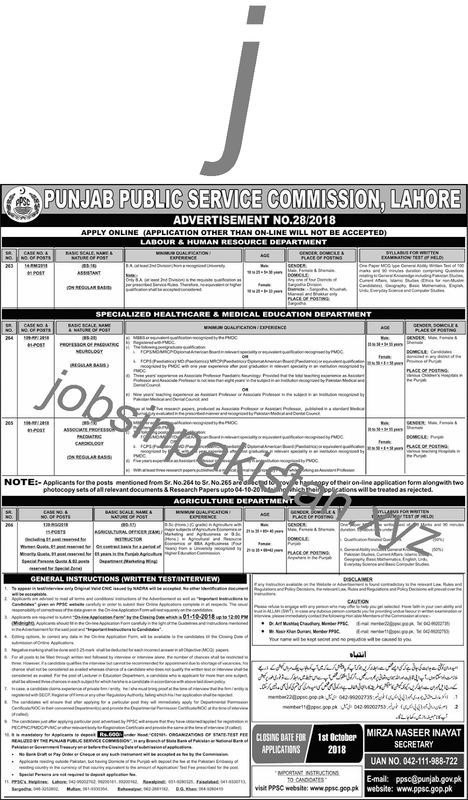 The Punjab Public Service Commission of Pakistan (PPSC) announce a 10+ jobs in Labour & Human Resource Department, Specialized Healthcare & Medical Education Department, Agriculture Department. The last date of submitting of form for PPSC Latest Jobs 2018 is 1 October 2018. PPSC Latest Jobs 2018 is listed below as per department name. Punjab Public Service Commission (PPSC) of Pakistan requires a applications for following empty posts.